Erskine knew the importance of marketing first-hand. When, for instance, in 1921 the National Automobile Chamber of Commerce asked thousands of car owners what automotive feature was most important to them, the answer received most often was "endurance". Erskine took that need to heart, penning a series of Studebaker ads explaining that Studebaker car sales were up while sales of replacement parts were decreasing markedly. The only conclusion was this: Studebakers were built to last. 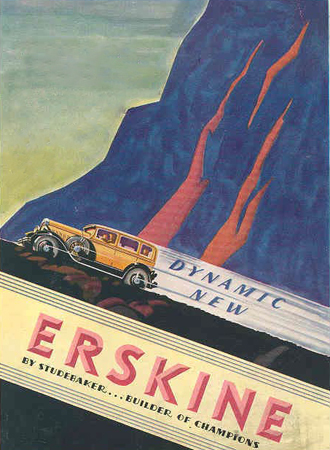 When it came to the Erskine, Studebaker definitely went on the offensive with an intensive advertising campaign that covered the globe. Ads appeared in Asia, Africa, Australia, Europe, and North and South America. There were billboards, posters in black-and-white as well as brilliant color, full-page ads, postcards, brochures, etc. Studebaker headquarters made stories and ad copy available to local papers everywhere. 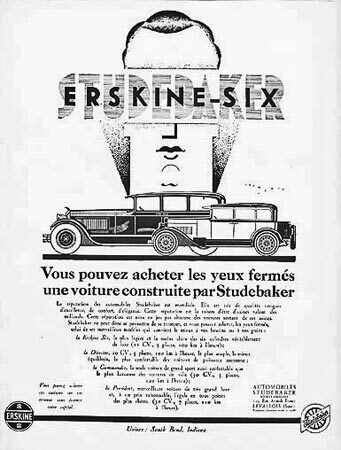 Just after its American debut, the Erskine was advertised in January and February 1927 as a car inspired by Europe, designed by Dietrich, built by Studebaker, approved in Paris—and now [the city's name] could see it. The ad flooded the market, appearing in Reading, Kingsport, Charleston, San Antonio, Miami, and many other American cities. With a slightly varied headline it also appeared overseas with a blank left for the name of the city and the country, e.g., "Singapore Acclaims It! Now All Malaya Can See It!" As is still the case, satisfied customers were some of the car's best salesmen, and print ads recounted their testimony. One happy owner related, "I have only one arm, but with my Erskine which handles so easily, I am not at all handicapped in my driving." Others mentioned its beauty, performance, and pickup: "There is nothing prettier on the road today. The Erskine Six more than fulfills my expectation as to performance and pickup. When the green light flashes, so does the Erskine—and away it goes ahead of all traffic." Another pleased owner said, "This is my 17th car and I would not trade it for the whole bunch that I have had before, and I have had some good ones!" A rainbow with a pot of gold (the gold Erskine) was the leitmotif of a number of strikingly colorful ads which again stressed that Europe had given its approval. The theme was carried out, as well, in a Spanish language ad that featured gold coins rolling beneath the car and across the road. "See the Car All Europe Has Approved"
European ads were in keeping with their markets. English ads, drawn by Woolcott, showed British country scenes. One, depicting a lady with her greyhounds, compared the Erskine's speed to that of "a greyhound straining at the leash." Another showed the driver of the car who'd stepped out to converse with a man on horseback while two ladies waited in the Erskine's back seat, a German shepherd standing guard alongside the car. Early French ads were black-and-white with the salient characteristics of art deco. A good number of those have survived. One showed cars amidst stylized skyscrapers while, in the foreground, a car rose over a tree-lined road with a hill comprised of parallel arcs. The text of the ad read, "For the Road. For the City. Undisputed King of the Road." Another ad, entitled "Nature's Most Beautiful Tableaux", showed an Erskine leaving a stylized city scape behind as it topped wooded mountain peaks. The idea was that an Erskine could take you out to the country to "fly across the plain to the sea or the mountain as silently and softly as when you are in town, for pleasure or for business." Other ads featured places specific to Paris like the Victory column at Place du Chatelet (where the text recommended the Erskine for all life's little travels or ventures afield), or characters like Columbine, a commedia character who appeared frequently at the Comedie-Francaise. On this occasion she was shown on a raked stage where she pulled the curtain aside to show the Erskine. Accompanying copy read, "The curtain rises on the car you expect to be spacious, comfortable, powerful, and easy to handle." Powerful horses also represented the car in some ads, one showing a horse jumping over the car and referring to Monsieur de Bouffon, an eighteenth century naturalist who introduced the idea of evolution into the realm of science. Copy for that ad noted, "If Monsieur de Buffon regarded the horse as the noblest conquest man has ever made, the modern man of class prefers the Erskine Six—lithe, elegant, gentle." The bottom of a number of these ads used words as art, bending "Studebaker Erskine" to look like the bottom of the car, with a Studebaker seal as the front wheel and an Erskine seal as the rear wheel. At least a few of these were designed by Jean Carlu, a famed graphic designer and poster specialist. His first poster in the art deco style was one for Charlie Chaplin's The Kid, and he was intrigued by the Cubists and their use of geometric shapes. In the Erskine ad entitled "The Car of Your Dreams", Carlu sketched the upper two-thirds of a woman's head. Straight lines and simple arcs completed her facial features, and her thin, dark hair started from a widow's peak and ended with a few tight curls over her ears. The Erskine appeared as if tattooed on her forehead and represented her dreams. The ad copy called the car perfectly adapted to French needs and the tastes of European motorists but built in America, seat of incomparable industrial and financial power. A companion piece showed the full face of a man with thin hair, nose in profile, and simply sketched, stylized features. His eyes were blindfolded by overlapping letters spelling out Studebaker Erskine-Six. This time the heading was, "You can buy a Studebaker car with your eyes closed." Its fine reputation and unique qualities of excellence, comfort, and elegance distinguished it. Carlu also depicted a woman with a short bob of the twenties in another ad, wearing a single pearl band set across her forehead, reminding us the Erskine was the pearl of the Paris show. There were advertising gimmicks, as well. On Saturday mornings at American dealerships there were free balloons and candy for the kids. One campaign had dealers convince young boys, a few days before the local showing of the Erskine, to slip the strings of a printed, die cut Arc de Triomphe over the door handles of parked cars. When the owners removed the folded card and looked inside, they were treated to a discussion of the Erskine's standards of performance. In Brazil, a marketing scheme appeared quite by chance in 1927. A group of lottery players played the license number of the Erskine pictured on a poster and won the equivalent of nearly $100. Thereafter the "lucky" car gained in popularity. Dealers could buy drum-type tire covers with the Erskine badge for 90 cents each, or have a dealer name added to it for another 50 cents. Proud owners of the car could pick up a copy of The Wheel, a promotional magazine, or purchase small mementoes like an Erskine cloisonné pendant necklace, or Erskine pennants at 55 cents a pair. 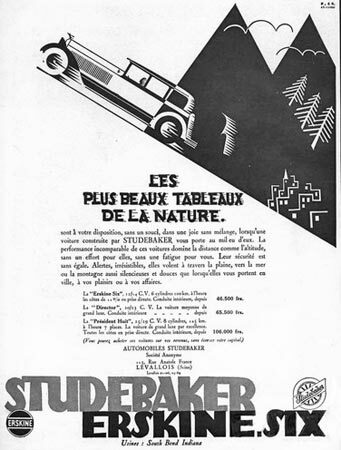 The Chicago advertising firm Lord and Thomas represented Studebaker at the time. Lord and Thomas, headed by Albert Laskey, defined advertising as "salesmanship in print" and was one of the first ad agencies to associate cars with fashion, status, and sexuality. They also pitched campaigns to an untapped portion of the market, i.e., women. When, however, Laskey completely disapproved of the way Erskine was running Studebaker in the early thirties, he resigned from the Studebaker account. Photographs of famous people also helped sell the Erskine. Baby Snookums (Lawrence "Sunny" McKeen) was a popular child star of the twenties who starred in a number of film shorts from 1926-1930. In shorts developed from "The Newlyweds" comic strip, the family included a beautiful wife, her fairly average husband, and their adorable, newborn, "Dennis the Menace"-type son who was practically bald save for a shock of hair standing straight up from the top of his head. 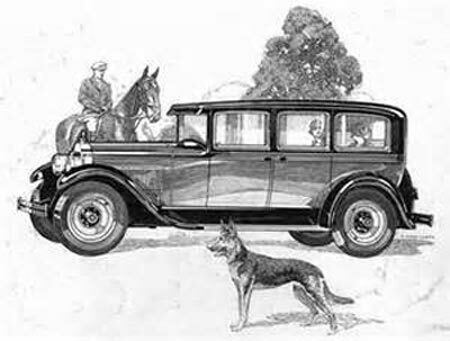 When, in May-July 1927, his real-life parents took him on a publicity tour to the East Coast, they drove an Erskine, supplied by Studebaker, of course. Another photograph that year depicted Albert Erskine with royalty, not only the 1927 Little Aristocrat Erskine but also Prince Wilhelm of Sweden. Nowadays it's Erskine's knickers that capture our attention but in the day it was the Prince and his choice of royal conveyance. While initial sales internationally were promising and reports from dealers were positive, only a year after the Erskine's introduction Ford brought out the Model A with a price tag of $525, about half that of the Erskine. A full-sized Oldsmobile was selling at just under $1200. In reaction to those challenges, Studebaker initiated changes to the Erskine, adding a more powerful engine and lengthening the car so it began to look like the younger cousin in the entire Studebaker line. It was beginning to appear that the European market wasn't all that interested in the Erskine and that the American market wanted something more recognizable as an American car, i.e., a larger, more powerful one. 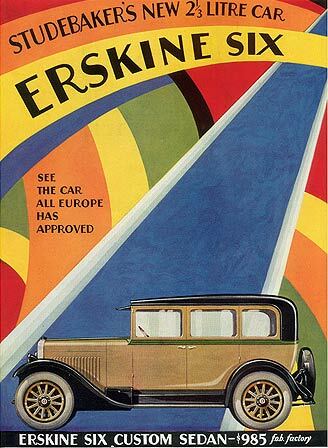 The Erskine made its debut in Europe in October, 1926, and the initial hoopla surrounding it carried it right through its U.S. introduction on January 7—in two locations. That day eighteen thousand people swarmed around Studebaker's South Bend headquarters to see the Erskine, and Erskine delivered the first of his namesake cars to Ann Studebaker Carlisle, daughter of his former boss Clem Studebaker. That same day at the New York Auto Show at Grand Central Palace a four-door sedan and a touring car were on display, and crowds of interested buyers milled around them. A promotional ad was headlined, "Erskine comes to Broadway via Champs-Elysees and Piccadilly Circus". Studebaker's president prophesied that "1927 will prove to be the most prosperous [year] in our history," a good thing since it marked Studebaker's 75th anniversary. The diminutive car was only 5'7-1/2" high, one ad quipping, "You can look over its top but you can't overlook its roominess". It was stylish with plenty of space. European automotive experts had proclaimed it "years ahead of its time". There were four body styles—sedan, business coupe, club coupe and touring (as well as a sport roadster later in the year)—and their paint schemes were certainly eye-catching. The custom sedan came in five different color combinations. One of those, for example, was sable and fawn for the body with pin striping in red and gold, maroon wheels, and blue-gray mohair upholstery. A sport coupe (with package compartment behind the driver's seat and a rumble seat in the rear) was available in a Waukegan (lake) blue with Blue Devil (dark blue) trim and bright red pin striping. One sport roadster came in Columbia River blue with hood and panel trim in green and leather upholstery in two-tone blue and green. To smarten the car even further, there were silk curtains for the rear windows. There were lots of reasons for purchasers to want the car, one called the "new wonder car", the "newer mode in motors", "the motor car value of the decade", and the "Little Aristocrat", a small car with a noble heritage. As one ad gushed, it was a car "with stalwart sinews and a stout heart that puts the miles behind like satin ribbons." It accelerated from 5 to 25 mph in 8.5 seconds, had an 18" turning radius, got 30 mpg, took up only fourteen feet of parking space, and could be serviced at any one of the three thousand Studebaker service stations across the country. Adjectives used in advertising were nearly limitless when it came to celebrating the many features of the Erskine, a car whose "amazing value made criticism impossible." The little car had "great stamina, correct balance, positive safety, new comfort, thrifty economy, super-reserve power, easy control" as well as "dashing style, flashing speed, flawless beauty, [and] rare value". In addition to all of that, it was also "extremely flexible, a real pleasure, [and] a rare convenience." The first year Studebaker sold around 23,000 Erskines, roughly 20% of their total volume. In July, across-the-board reductions of $30 per model may have boosted domestic sales, and the Erskine Six pushed overseas sales up nearly 70%. Still, Studebaker was not altogether satisfied with sales. They saw an 8.5% decline in profits for the year and viewed the Erskine only as "filler" for their regular line. To improve the Erskine's market share, they asked thousands of American owners to complete a questionnaire after they'd driven their cars a few thousand miles. Those suggestions led to refinements, one of which was a longer car. By November, Model 51 was available with a wheelbase an inch longer than the original Model 50. The frame was widened by four inches in the rear and the car's center was lowered by an inch. With the longer, wider car came a narrower, deeper radiator and a more rounded radiator shell. The boxes on the fenders had been moved elsewhere. The car's interior also had more headroom; there were arm rests for the rear seat; and the front seat was adjustable to three positions. There was greater frame rigidity, and a more powerful Continental 9-F (43 hp) engine with a larger bore (increased from 2 3/4" to 2-5/8") was used. Cowl lamps, miniature versions of the acorn headlamps, appeared. One ad called the new model 51 "in every way a greatly improved car"—and it came in a dizzying variety of body styles. The top of the line was the royal sedan which came with special paint and door panels as well as wire wheels and two spares mounted on its front fenders. It was followed by a club sedan for which Studebaker began to build bodies in-house and a standard sedan, the lowest priced ever, at $795. There was also a four-person royal cabriolet or two-person standard cabriolet (the cabriolet having replaced the coupe), a touring car, a half-ton panel truck (metal over wood body with wide belt molding over the length of the body), a screen delivery truck, and even a limousine. 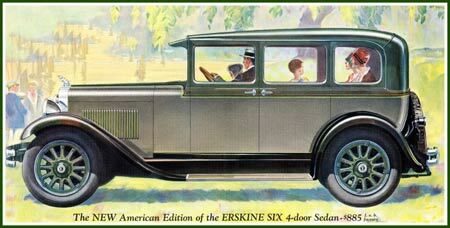 The 1928 new American edition of the Erskine was advertised as "roomier, bigger, more powerful" with a reduced price of $795 for the sedan. 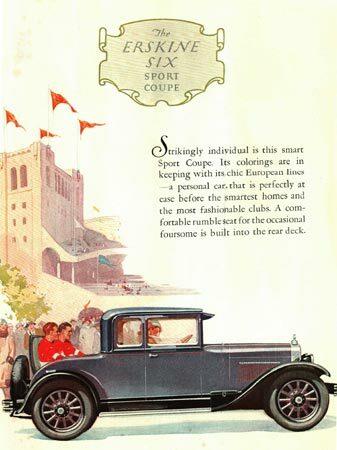 Erskine, ever optimistic, called 1928 "one of the most important of the entire 76 years of Studebaker's history". Newman Smith, brother-in-law to F. Scott Fitzgerald and a well-known expatriate banker living in Brussels, established himself as head of Motor Dealers Corporation, a company founded expressly to finance European sales of Studebaker and Erskine cars, introducing European customers to American consumer credit. Everything was in place to increase Erskine sales, and, in fact, during the first six months of 1928, Erskine sales surpassed all those of the prior year. Studebaker would go on to sell a total of about 37,500 that year, accounting for 28% of its total sales volume. 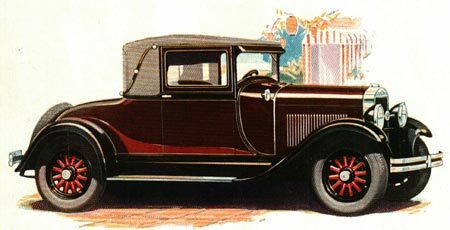 In June, 1928, all Studebakers got new bodies and more luxurious interiors. On the Erskine that meant Model 52 with a polo-cap style visor, a stylized "E" on the headlight support bar, and a winged radiator cap. Another addition was a curved, sweeping styling line in contrasting color that began at the bottom of the front door a few inches from its far edge, extending over the cowl and down the other side. There was also a new instrument panel; a rear window on sedans that could be lowered halfway down; and a flat, hard rubber steering wheel. The seats were well-shaped and fully cushioned. The royal sedan had fenders in a contrasting color, mohair upholstery, a recessed ash tray, and an instrument panel in antique ivory. One version of the club sedan was offered in blue with black top and fenders and velour upholstery. On the cabriolet (with landau bars), there was a significant tilt to the spare tire mounted at the rear, extending the overall look of the car. The cabriolet might come in brown and tan with a red pin stripe or burgundy and gray with red wheels and a red styling line swoop. Another inch was added to the car's wheelbase and hydraulic shock absorbers were installed. The car's ride was made smoother than ever. The car had been around long enough to have claimed some race victories, too, and its reputation for speed and endurance no doubt aided in its climbing sales. It held records in international competition in London, Edinburgh, Sydney, Barcelona, and a number of other cities. It had completed an endurance run in Argentina and, in Hamburg's skill test (Geschicklichkeitsprufung), it had completed twelve trials with a total of twelve penalties, the only car to complete all trials successfully. In February 1929, at Brooklands trials, an Erskine Sedan went 500 miles at an average speed of 58.8 mph. Closer to home, the Erskine completed the run of 401 miles over Sierra Mountain summits in an elapsed time of 17 hours, 39 minutes. In October, 1927, in a timed race on the Atlantic City Speedway two stock Erskine Sixes (a Sedan and a Coupe) went nearly 1300 miles in 24 hours of continuous driving. The sedan's average speed was 54.103 mph while the coupe averaged 53.289 mph. Although those times would be nothing today, they were significant milestones for a small car of the times. With such successes, the come-on to buyers was that they, too, could eventually reach speeds of 62 mph and that the day they drove their car home, they could safely run it to 40 mph, with no required break-in period. You'd need to change the oil every 2500 miles but the little car guaranteed big car performance at small initial and operating cost. It was said to be the finest, fastest car available under a thousand dollars. The 1929 Model 52 was again introduced at the Paris Auto Show with a one-of-a-kind Erskine sedan featuring tapestry upholstery, bronze lacquered hardware, three shades of French violet for exterior paint, a silver roof and window reveals, and running board shields and belt painted in a futuristic pattern. It was a real show stopper and a gentle reminder to onlookers that the Erskine was one with the new world of modernist art. A world away, the Erskine was being advertised for the "modern farmer", too, since it was "beautiful, sturdy, dependable, economical," and "ideal in every way". It was a car that stood up to the road, and testimonies included those from the Tennessee State Highway Department that used fifty Erskines in its fleet and a North Dakota rural mail carrier who ran it on snow-covered and muddy roads. The annual average cost for replacement parts was low, too, less than one dollar per car. A testament to the times, the 1929 Owner's Manual reminded owners to lock their car. It also spelled out the very real dangers of running a car in an enclosed garage, encouraged drivers to carry a fire extinguisher in the car, and provided self-help tips for resolving problems of an engine stopping, overheating, missing, or failing to start. Body styles were more limited with this version and amounted to variants of a tourer, sedan, or cabriolet. Prices ranged from $860 to $1045. About 11,500 units sold in 1929, representing 12% of Studebaker's total sales. Sales were definitely down for Studebaker—and for the rest of the country, for that matter, after October's stock crash. A lot was riding on 1930's Model 53 "Dynamic New Erskine". 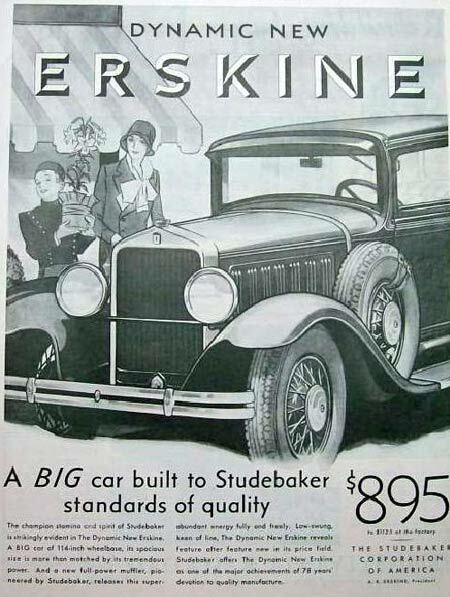 Studebaker's plan was to sell 1.5 million cars, up from the 450,000 they'd sold in 1929, and they were largely relying on the Erskine to drive those sales. With seven thousand dealers worldwide, they continued to believe increased sales were possible. Most styles were back in play—sedans (standard, club, royal, and landau), tourers (standard and regal), two and four-passenger coupes, and roadsters. 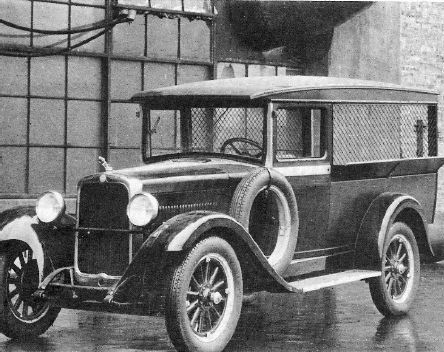 The wheelbase had increased markedly, to 114", and its new 205 ci Studebaker engine (L-head with removable head) produced 70 hp. It had more than a passing resemblance to the Dictator Six and was said to deliver "more power per pound of weight than any other car under $1000". In styling and power, it was much closer to the larger cars popular in America, one ad intoning, "BIG in everything but price". 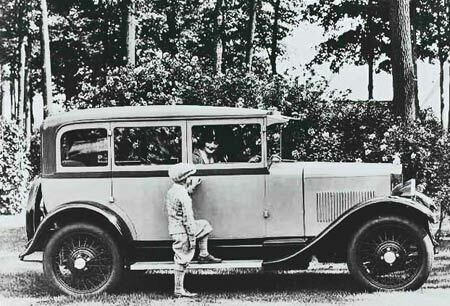 For the first time an Erskine made its debut in America—at the New York Auto Show on January 4, 1930. Besides its new engine, it also had a spacious Studebaker body with a long, low-slung chassis, graceful lines, and a double drop frame, i.e., the side rails went over the front and rear axles. It featured wide crown fenders, a triple- belted molding, and chrome bright work. Seats were upholstered in mohair and deeply padded over coil springs, and it had an adjustable front seat and steering column. There was a steel core, four-spoke steering wheel; choke and starter buttons on the instrument panel; concealed windshield wipers; and a rear luggage rack. The foot pedals were rubber-covered and the rear door was wider than ever, allowing for greater convenience for passengers. A spring-loaded, semi-automatic choke control prevented over-choking the engine and an embossed shield appeared over the gas tank at the rear. An 80 mph speedometer let drivers know the car was going places and silk shades at the back and rear quarter windows let them know they were going in style. There was a wide choice of exterior paint colors with names every bit as chimerical as those of today: Manola gray, rosedale and Malaga maroon and greens in chateau, Ardsley, nephrite, Nevada, and catona. Twenty finishing operations were applied to the lacquer to make it shine. There was a new Erskine radiator badge, too. "Erskine" still appeared in block letters and there was a downward-pointing dagger (a variant of that used in the Erskine family coat of arms) in the dark central vertical portion of the badge. Studebaker engineers, led by Chief Engineer D.G. "Barney" Roos and research engineer W.S. James, were determined to keep road noise to a minimum. They gave the engine a rubber cushion and utilized FullPower mufflers. They placed a vibration damper on the crankshaft and also installed a Burgess acoustic muffler. The muffler had steel wool rather than baffle plates then used in conventional mufflers so the muffler would absorb sound waves while offering no resistance to letting exhaust gases pass through. A long tail pipe with multiple perforations was surrounded by a jacket containing the steel wool. No power was lost to back pressure. On February 25, in Pomona, California, the Erskine set a new record climbing Mount Baldy, making a 7.1 mile climb in ten minutes, forty-four seconds. The Erskine, at last, had plenty of power under the hood, and Studebaker capitalized on that achievement in its sales literature. Studebaker also mounted a serious advertising campaign, blitzing the market with ads of all sizes and utilizing a more representational artistic style. The Erskine was depicted at a ski resort; at a train station where, at the end of the day, a briefcase-carrying father greeted his wife while their young daughter hugged his neck; and at a hotel florist shop waiting for the bellboy to carry a lady's Easter lily out to the car. Ads guaranteed would-be purchasers that the Erskine was a big, powerful, safe, comfortable and significant car and that its "design [was] as modern as the dynamic new skyscraper architecture of the day." Unfortunately, the economics of the day outweighed all the new Erskine had to offer. There were insufficient sales to turn a profit. In May, President Erskine, thinking the car would sell better if it had the Studebaker emblem, radiator medallion, and hub caps, suggested that the Erskine be renamed. Studebaker accepted that recommendation, dropping the Erskine from its line and continuing it as a Studebaker Six. For the change, some parts were available at no cost to dealers and Erskine owners who asked for them. For all others the cost for the package of hub caps, tail light cover, and brake and clutch pedals was five dollars. When the Erskine name was dropped, so was the business coupe. During the four years the Erskine was produced, more than ninety-five thousand units rolled off the assembly line. The idea of breaking into the European market with a European-type car was novel. Producing an assembled car, however, rather than one produced with Studebaker parts, was not a successful business model. Erskine's optimism kept him believing in the Erskine's success even while striving to improve it through styling changes and more powerful engines. If Europeans had been more impressed with the mechanics of the car, if Americans had been more apt to accept a nimble small car, if its cost had more nearly matched that of its competitors, and if the global economy had been expanding rather than contracting, the Erskine might have made it. Studebaker had little control over all those "ifs", though, and Erskine had to witness the demise of his namesake car.